Isonomist's son (see here) died yesterday afternoon. in the company of Thy saints forever, for Thou art merciful. Eternal light shine upon him, O Lord. Kudos to Twiffer for referring me to another NASA site, Visible Earth, which features images of earth made by satellites or by astronauts on shuttles. 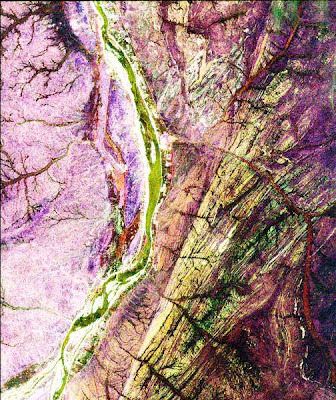 This image is of a portion of northern Sudan, taken with a radar instrument carried aboard the shuttle Endeavour. The radar exposes hidden sub-surface features, such as, in this instance, rock formations covered by desert sand. The curving green band on the left side of the image is the Nile and its flood plain. To the right of the Nile is a nearly straight line separating reddish from yellowish portions of the image. This is a fault line that delineates a collision between two ancient continents which happened 600 million years ago. Further details can be found here. 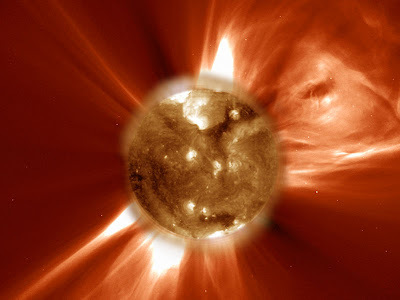 This image, made by the SOHO observatory (see here), which orbits the Sun at a point inside the earth's orbit, shows a coronal mass ejection. Events like this, in which the Sun violently expels some mass, occur from time to time, with the frequency varying cyclically. When bubbles of magnetic plasma ejected in these events reach the earth, they can interfere with many forms of electromagnetic data transmission. This image was taken from Astronomy Picture of the Day. A warming thought on a chilly day. Only ten days until Mets pitchers and catchers report for training. Addendum: Sorry, Twiffer. You have to wait an extra day. Red Sox pitchers and catchers don't start until the 18th (spring training starting dates can be found here). 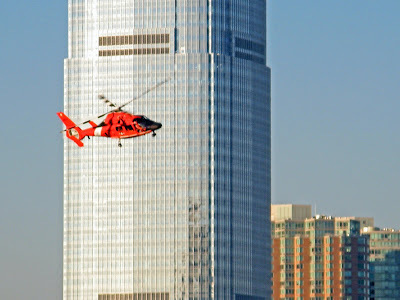 On a clear morning, a Coast Guard helicopter banks into a turn over the Hudson River, in front of New Jersey's tallest building. 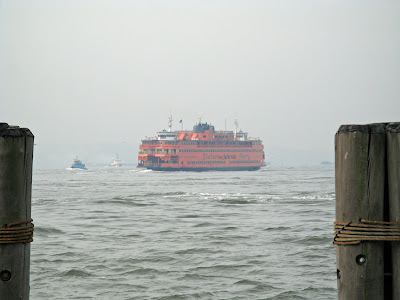 On a hazy morning, a Staten Island ferry approaches its Manhattan terminal. 2. Those great Satuday Night Live skits about "da Bearsss." 3. Rex Grossman, the Bears' QB, was a Florida Gator. But then my mother says, "Please root for the Colts. Tony Dungy is such a fine man." By way of background, Mom has lived almost half of her ninety years in Tampa, and spent the past thirty or so of those loathing the Tampa Bay Buccaneers, with two exceptions: Steve Young, when he was their quarterback, and Tony Dungy, who was their coach for several seasons. Well, I like Tony, too, even if he works for a franchise I despise. So, I'll relax and enjoy the game.